Cordero, short story by Christopher Edelen. The Write Launch. Miski spoke only Quechuan. Her dialect was one of many in a beautiful family of loosely related languages. These languages were once employed in service to the Inca Empire, something Miski didn’t know. Now, the languages are used only amongst a small and impoverished population, spoken only by various groups of Quechua peoples inhabiting various parts of the Andes. Cusco is home to a great number of these peoples, and home to Miski. The city is a breathtaking sprawl, sitting 11,000 feet above sea level in southeastern Peru. A Spanish Colonial island of humanity crocheted with cobblestone streets and towering, parapet-laden iglesias. Cusco once served as the glistening capital of the Inca Empire. Though Miski didn’t know that. Miski, in fact, knew almost nothing of her heritage or Cusco’s. She knew very little of her heritage because she knew very little of her ancestry. She knew very little of her ancestry because she knew very little of her parents. At eight years old, Miski had been an orphan for four years, dancing whimsically through the streets of Cusco on her own. She never thought to seek out any type of surrogate caregiver. What she did know of the customs of her people she had gleaned only by observing others. She saw other Quechua people peddling in the streets, and did her best to dress herself according to their fashion. From a gaggle of kind old women she had cunningly stolen the montera on her head. Rummaging through piles of what looked to everyone else like debris, she stumbled upon the colorful k’eperina on her back and the well-worn ajotas on her feet. Her visiting customer base never suspected that she was an orphan and a vagrant; they only saw another child of the traditional Peruvian culture. 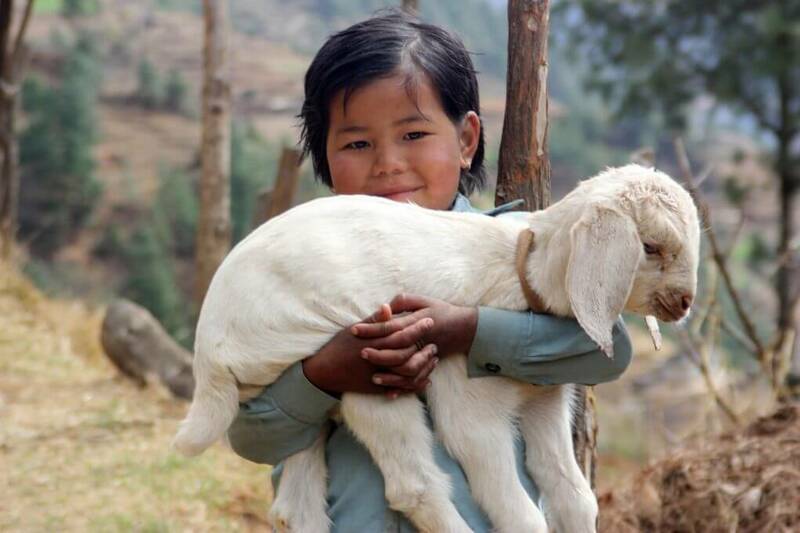 Miski had exactly one more pet than most orphans her age, a tiny lamb she called Suyana. Like most of her fellow city-dwelling Quechua people, Miski was certainly no farmer, so lambs like Suyana generally had one way of earning their own upkeep. If they were deemed unsuitable to the task, they were largely abandoned, and this is how Miski came to forge a partnership with her little lamb. When an unsuspecting tourist consented, the Quechua would unceremoniously hand their lamb over, and the tourist’s traveling companions would take an adorable picture of their friend or family member holding a baby lamb, surrounded by native Quechua peoples against the exotic backdrop of the cobblestoned and thoroughly fountained Plaza de Armas. These photos, when posted on Facebook or elsewhere, were largely thought to make their subjects appear very cultured and interesting. In exchange for providing such a unique service, the Quechua would then hold their hands out for a tip. Quick-witted tourists would hand over a small amount of nuevo sol immediately, but tourists of the dimmer variety had to be hassled by the Quechua until they gave up and decided to purchase the right to resume their business undisturbed. Suyana, the lamb, had once failed miserably at luring tourists into taking pictures. Her then-owners believed the difficulty to be caused by the poor lamb being hideous. Chunks of hair had permanently taken their leave of Suyana’s body, and a jarringly pronounced scar shred its way from corner to corner across the entirety of her little lamb face. It was generally assumed that her looks were the result of an altercation with one of the city’s many strays. That type of thing happened all the time. These disfigurements not only rendered Suya the opposite of photogenic, but also generally gave tourists the impression that they might catch a disease from holding her. So one day, as Miski was looking on, Suyana’s previous owners abandoned her on a patch of grass near the Iglesia de Santo Domingo. Miski decided that an ugly lamb was better than no lamb, so she waited until the previous owners were just out of sight, then ran over and picked her up. She began to say over and over again, “Suyana, Suyana,” teaching the lamb the name she’d decided to give it. Miski, perhaps because of her youth, never had the same trouble that Suya’s previous owners experienced trying to entice tourists into posing with her. Just under half of the groups she approached seemed delighted to take a picture with her and Suyana, though most of them preferred to crouch down next to her, leaving it to her to hold the lamb. She also nearly never found herself having to hassle people for her elective, but expected payment. The few times she didn’t receive her payment right away, she failed miserably at hassling her would-be customers for it, being small and relatively slow with lamb in hand. She quickly learned only to approach couples or families, who were not in the habit of stiffing young girls in public. Being an orphan, Miski would release Suyana from her tired arms when night fell over Cusco, and the two of them would walk from the plaza to a quiet alley of the city to sleep. Early on in their relationship Miski found herself fighting off stray dogs that, more often than not, wanted to eat Suyana. Nowadays she usually laid her head to rest in one of a few places where she had fought the dogs off consistently enough that they considered the area to be Miski’s territory and would leave her and Suya in peace. This she did tonight. She fell asleep with her back against a cold concrete wall, her stolen montera tilted just over her eyes, and Suyana’s head in her lap. In the morning she woke with the sun and gently nudged Suyana to do the same. She checked the pocket where she had put the previous day’s collection of nuevo sol, as she did every morning, and when it was all accounted for they started their day with a visit to their friend Elena. Elena owned a small shop on Calle San Martin that sold souvenir-style knickknacks and high-end original works of art. She lived above the shop, which her wealthy parents rented for her, and never really did anything other than run the shop. She couldn’t afford any employees to staff the place in her absence — not that she had any money with which to entertain herself if she did find any spare time. Elena lived a very privileged life by Peruvian standards. Her parents owned a small hotel in Lima that had afforded Elena a semester abroad in America when she had been an art major at the Universidad de Lima. She dressed in an American fashion: long, thin sweaters and jeans. She always straightened her shoulder-length, light brown hair to better frame her pretty, distinctive face, and to color the imploring gaze of her marvelously brown eyes. She had no interest in ever running the hotel, so her parents indulgently rented her this space in Cusco to pursue her own passions. Her original idea had been to only sell works of local art, but when that didn’t make any money her parents insisted that the shop start selling souvenirs, and Gatorade, and crackers in addition to the locally sourced painting and pottery. Even still, her shop lost money every month. Her parents could afford to take the loss for the time being, and so would only gently suggest to Elena that she return to Lima to help out and eventually take over the hotel. Being eight, and having never really had parents to ask, Miski did not actually know what to do with all the nuevo sol she earned offering Suyana and herself to pose for lamb photos. That being the case, she regularly visited Elena’s shop. Every morning Elena would trade whatever sol Miski had in her pocket for two packages of crackers, a juice box, and a bottle of water. The water and one of the cracker packages Miski gave to Suya, keeping the other crackers and the juice box for herself. As one might imagine, most of the time Miski earned far more nuevo sol than the value of these four food items, but she had no idea how money worked and was simply glad that she and Suyana got to eat everyday. Miski and Elena did not share a language, so Elena justified her actions by way of this thought: even if I wanted to, I couldn’t properly explain to Miski the monetary system governing most transactions in modern Peru using body language alone. Besides, the rapture that overtook Miski’s face and motion while she ate her crackers and drank her juice was powerful enough to assuage any guilt Elena might have. After today’s meal, Miski waved goodbye to Elena. She and Suya took their leave, heading toward the Plaza de Armas. Watching Miski and her lamb walk down the Calle San Martin toward the plaza, Elena asked herself again why she had never invited Miski to stay the night at her apartments above the shop, knowing full well that the poor girl and her lamb slept outside every night, exposed to all sorts of peril. Miski and Suyana worked the square with their usual bubbly vigor, cutely offering tourists the opportunity to appear much more interesting to their family and friends back home or, in some cases, the opportunity to hold a lamb for the first time. Suyana had grown accustomed to every sort of human interaction, and while she never really turned on the charm, she was always submissive and willing to being handled. The two hustled until dusk, as they always did, stopping only because fewer people were willing to try taking pictures in the dark. She and Suyana walked through the darkening streets to another one of her usual alleys, where Miski had to punch a stray terrier mutt she had never seen before. She hit it square in the nose, and it immediately ran off, its string of yelps hanging in the warmth of the air. She rested her small head against the cold concrete wall and tilted her montera to cover her eyes. Suya climbed halfway onto her lap and they fell asleep under the canopy of a blinking, starlit night. This was her life. The next morning Miski only woke after Suyana had been nudging her for five minutes. She tilted up her montera to find that the sun had been up for a good hour while she had been sleeping. No matter if this happened occasionally; she rarely missed out on any lamb photos just by spending the first few hours of daylight somewhere other than the Plaza. She hugged Suya in gratitude for waking her up, then the two of them shuffled off the night’s sleep on their way to Calle San Martin to see Elena. As they approached and the shop came into view, Miski stopped dead in her tracks. She nearly dropped Suyana in her sudden befuddlement. All the lights off, the building spoke of Elena’s absence. A sign Miski thought she had seen before hung on the shop’s closed entrance door. She couldn’t be sure she had seen the sign before, as she couldn’t read it. She looked up and saw the lights in Elena’s apartments were also off. Oh well, she thought, this isn’t the first time Elena has gone somewhere else for the day. Miski and Suyana had gone days without eating before, to be sure, so they weren’t especially hungry. Miski held onto yesterday’s sol, and the two of them hit the square to make tourists look more interesting. She figured they would see Elena again tomorrow. They thought they could make it through the day without eating, but by the middle of the afternoon they weren’t so sure. Just as the sun began to lay itself down behind the mountains, Miski and Suyana talked it over and decided it would be best for them to try and find some food. Miski first tried to cut out the middleman, pointing into her open mouth rather than holding our her hand after taking a lamb photo. Most of the people she asked for food in this way got the impression that she was trying to sell them Suyana as food. They found the notion barbaric and wouldn’t even give Miski her customary payment for the chance to appear vastly more cultured. Miski had no idea why this was happening, but did know that this strategy for finding food was not working at all. By the time the sun had completely disappeared behind the mountains, Miski had devised another plan. This new plan consisted of knocking on the doors of shops similar to Elena’s, holding out some of her acquired nuevo sol, and pointing into her open mouth. She tried this a few times, but the keepers of the shops they entered were not as nice to her as Elena was. They yelled things like, “Get that filthy animal out of here, you urchin!” Miski failed to understand their words, so they would come out from behind their counters and chase her off, waving their arms wildly up and down in a frantic and frightening gesture. Finally, in desperation, Miski tried to fall back on her old tactic of cornering rats in enclosed alleys. This was a struggle. She was out of practice, and had to hold poor Suya the whole time as the lamb was simply incapable of keeping up with her on foot. Miski finally managed to chase one not-so-clever rat into a corner, only to have a stray dog come up behind her and knock her over. She persisted in chasing the rat until the dog snatched it up in its rotting, foaming teeth. Miski considered fighting the dog at this point, but realized she would have to set Suyana down to do so, which would in all likelihood result in the dog dropping the rat and taking a bite of Suyana instead. Miski tightened her grip on her beloved Suya and backed away slowly. Miski limped away tired, hungry, and utterly defeated. She set Suya down to walk after she had put a safe distance between the two of them and that dangerous dog. She decided it was time to find one of her familiar alleys and fall asleep, but realized that she had lost her way while chasing down the rat. With no better option, she guessed at the direction she thought they had come from and started walking. Turning down another unfamiliar alley they came upon a man dressed in a white top and baggy checkered pants who was smoking a cigarette by a wooden screen door. Seeing Miski and her lamb, the man frowned at them. He said something to her in Spanish. Miski did not understand, and shrugged to show it, so the man tried again in English but got the same response. Pitifully, Miski pointed once again at her open mouth without any understanding of what this man was saying to her. “Ahhhhhh,” the man said, nodding. He continued speaking aloud, but to himself, in Spanish. He said more things that Miski failed to understand, but she did understand when he held up his index finger signaling for her and Suya to wait outside. The man stole into the building, which Miski had no way of knowing was the kitchen of his own restaurant, and came back out with a plate of roasted alpaca and quinoa. Gleefully Miski dug in, offering to split the dish with Suyana. Suya ate the grains happily, but avoided the meat. It was no crackers and juice, but they were grateful, and Miski hadn’t even needed to give up her hard earned sol! When they finished, she handed the man back the empty plate. Waving, she thanked him in Quechuan. He shrugged and took the plate back into his kitchen, as Miski and Suyana started off again in the direction that felt right. After finally succumbing to the weight of sleep and waking up again still exhausted, Miski and Suyana eventually found their way back to familiar territory. They didn’t again find Calle San Martin until the middle of the afternoon, but they did find it. The two of them headed down the street toward Elena’s shop, hoping to find it open. Instead they found Elena locking the door to her shop and carrying a box of her personal effects wedged under her arm. She took the sign off the door and dropped it carelessly into the box. Turning away from the door, Elena saw Miski holding Suya, and resumed crying, which she had been doing for some time now. Miski couldn’t possibly hope to understand anything about this other than Elena’s distress. Thinking it might help, she pulled out the three days’ worth of nuevo sol and offered it all to Elena. “No dear,” Elena choked out through a sudden flood of sobs, “I don’t have anything for you.” She double checked her box for anything edible, but found nothing. Miski didn’t understand much about Elena’s life, but she couldn’t think of a reason why the sol would be so upsetting. She set Suya on the ground and wrapped her arms around Elena’s hips in an embrace. She let go, backed up a pace, and held the sol out again for Elena, smiling as big as her small face would allow. Elena continued to sob uncontrollably. Nearly collapsing, she set the box down and sat on the curb. When she felt as though she could speak again she said, “Hold on,” and held up her index finger (a gesture which Miski, by now, understood well enough). Elena pointed to her box on the sidewalk to ask if Miski and Suya could keep an eye on it for a minute. After Miski nodded her consent with a smile, Elena walked a few paces away to make a phone call. She was on the phone for what felt to Miski like an eternity, but she and her Suya kept a vigilant watch over Elena’s boxed up belongings. Finally Elena came back to where they had been sitting on the sidewalk, tears dried up on her face. She was puffy-eyed and sulking, but managed to smile genuinely. “Well, do you want to come to Lima?” she asked. Miski didn’t understand what Elena was asking her, but her friend was smiling so big through those bloodshot eyes that it had to be good. She looked to Suyana, who nodded in approval. Elena picked up her box of things and took Miski’s hand with her other arm. With Suyana following closely behind, Elena helped Miski into the back seat of her Land Rover. Suyana settled comfortably in the trunk. Miski looked around, clueless but optimistic. Christopher Edelen is a new author and poet. He grew up the oldest of three children, splitting his time between Rochester, NY and Louisville, KY. He is currently living in Los Angeles with his dog. He is currently working on his webcomic "anotherno(te) comics,” and writing on the web series "Pretty Dudes." His writing has appeared in FORTH magazine and Poetry Leaves. Read more articles by Christopher Edelen. All original work attributed to Christopher Edelen © 2017 Christopher Edelen.